Captain Henry Arthur Chichester of the 3rd and 1st Battalions of the Devonshire Regiment. Son of Colonel Arthur C. Chichester and his wife Charlotte. Born in Barnstaple in the December Quarter of 1882. Killed in action 20 October 1914 aged 32. 2nd Lieutenant Arthur James Purkess of the 13th Battalion, the Yorkshire and Lancashire Regiment. Son of James and Mary Purkess of Hill Moor, Culmstock; brother of Cyril (see below). Born in New Malden, Surrey in 1883. Died 1 July 1916 aged 33. 8652 Sergeant William John Milton of the 1st Battalion, the South Wales Borderers. Son of Samuel and Jessie Milton. Born in Culmstock in 1886. Died 19 October 1918 aged 32. Awarded the DCM and the MM. 10854 Private Samuel Coles of the 8th Battalion, the Devonshire Regiment. Son of Thomas and Caroline Milton of Bowhayes, Culmstock. Born in Culmstock in 1896. Died 25 September 1915 aged 19. 16/1996 Private James Davis of the Royal Warwickshire Regiment; formerly 148548 of the 11th Battalion, the Royal Field Artillery. Son of Samuel and Elizabeth Davis. Born in Culmstock in 1881. Died 10 April 1917 aged 36. 19031 Private Harry Dunn of the Devonshire Regiment. Son of William and Ellen Dunn. Born in Willand in 1892. Died 1 July 1916 aged 24. 2374 Private William Henry Ford of the 1st/4th Battalion, the Devonshire Regiment. Son of William and Catherine Ford. Born in Witheridge in the December Quarter of 1881. Died 21 January 1915 aged 34. 13495 Private Walter J. Hake of the 103rd Coy, the Machine Gun Corps; formerly 20750, of the Devonshire Regiment. Son of Joseph and Mary Jane Hake; husband of Annie Hake of Wellington, Somerset. Born in Culmstock in 1892. Died 1 July 1916 aged 24. 7230 Private Edgar Joseph Hooper of the 1st Battalion, the Somerset Light Infantry. Son of John and Anna Hooper of Culmstock. Born in Winsford, Somerset in 1885. Died 1 December 1914 aged 30. 26059 Private Francis Mutters of the 10th Battalion, the Devonshire Regiment. Son of Robert and Caroline Mutters. Born in Culmstock in 1884. Died 24 April 1917 aged 33. TF/266013 Private Cyril Lewis Purkess of the 2nd Battalion, the Middlesex regiment. Son of the late James and Mary Purkess of Culmstock; brother of Arthur (see above). Born in Surbiton , Surrey, in 1891. Died 27 August 1918 aged 27. 8601 Private Alfred Quick of the 2nd Battalion, the Devonshire Regiment. Son of William and Selina Quick. Born in Culmstock in 1888. Died 27 November 1914 aged 25. 100284 Private Charles Salter of the 49th Battalion, the Canadian Infantry ( the Alberta Regiment). Son of George and Lucy Salter. Born 18 July 1891. Died 15 September 1916 aged 25. 51133 Private Wilfred William Salter of the 17th Battalion, the Manchester Regiment. Son of Thomas and Eva Salter of Culmstock. Born in Culmstock in 1894. Died 26 April 1918 aged 24. Regimental number not traced. 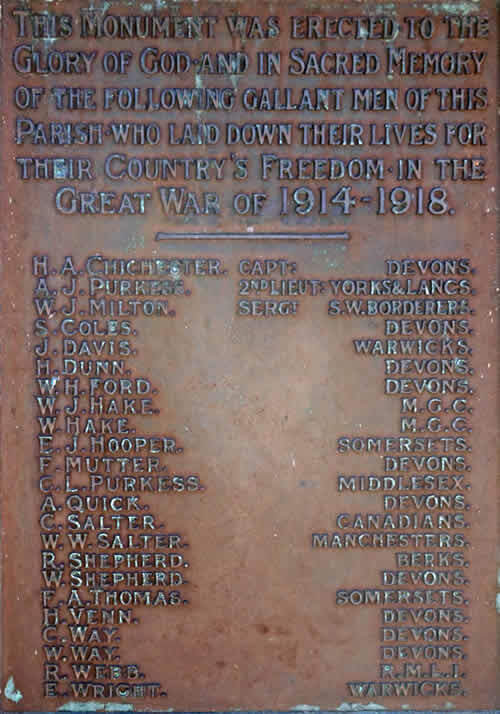 The Memorial places him in the Royal Berkshire Regiment but he may have been moved. Son of William and Ann Shepherd. Born in Hockworthy in the June Quarter of 1895. Date of death not known. 3/6751 Private William Samuel Shepherd of the 2nd Battalion, the Devonshire Regiment. Son of Charles and Mary Shepherd. Born at Dunkeswell Abbey in 1891.Died 1 July 1916 aged 25. 26193 Private Frederick Ahiman Thomas of the 7th Battalion, the Somerset Light Infantry. Son of Ahiman and Sarah Jane Thomas. Born in Culmstock in 1884. Died 25 December 1916 aged 32. 6689 Private Henry Venn of the 9th Battalion, the Devonshire Regiment. Son of Charles and Jessie Venn. Born in Clayhidon in 1889. Died 1 July 1916 aged 27. 10860 Private Charles Way of the 8th Battalion, the Devonshire Regiment. Son of Emma Way and the late Francis Way of Culmstock; borther of Walter (see below). Born in Culmstock in 1895. Died 16 July 1917 aged 22. 18257 Corporal Walter Way of the Machine Gun Corps; formerly 10846 of the Devonshire Regiment. Son of Emma and the late Francis Way; brother of Charles (see above). Born in Culmstock in 1896. Died 15 July 1916 aged 20. PO/2093 (S) Private Richard Webb of the 1st Royal Marine Battalion, the Royal Naval Division. Son of James and Mary Webb. Born in Churchstanton, Somerset, in 1894. Died 22 August 1918 aged 24. 267991 Private Ernest Wright of the 2nd/7th Battalion, the Royal Warwickshire Regiment. Don of Henry and Elizabeth Wright. Born in Kentisbeare in 1895. Died 29 April 1917 aged 22.